This book is an essential study aid for students preparing for the London College of Music Acoustic Guitar Grade One examination. 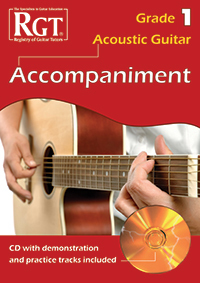 The book contains 10 accompaniment chord charts for you to practice – all designed to reflect the exact requirements of the London College of Music Grade One Acoustic Guitar exam. You will also be given advice on how to develop and improve your accompaniment skills. The included audio tracks feature recordings of 10 melodies for you to accompany, plus 10 demonstration tracks to give you ideas and show you the type of accompaniment that is expected in the Grade One exam. This book is an essential study aid for students preparing for the London College of Music Acoustic Guitar Grade Two examination. The book contains 10 accompaniment chord charts for you to practice – all designed to reflect the exact requirements of the London College of Music Grade Two Acoustic Guitar exam. You will also be given advice on how to develop and improve your accompaniment skills. The included audio tracks feature recordings of 10 melodies for you to accompany, plus 10 demonstration tracks to give you ideas and show you the type of accompaniment that is expected in the Grade Two exam. This book is an essential study aid for students preparing for the London College of Music Acoustic Guitar Grade Three examination. The book contains 10 accompaniment chord charts for you to practice – all designed to reflect the exact requirements of the London College of Music Grade Three Acoustic Guitar exam. You will also be given advice on how to develop and improve your accompaniment skills. The included audio tracks feature recordings of 10 melodies for you to accompany, plus 10 demonstration tracks to give you ideas and show you the type of accompaniment that is expected in the Grade Three exam.